Here’s the thing: a Viking River Cruise is one thing, a forced march across Italy is quite another. 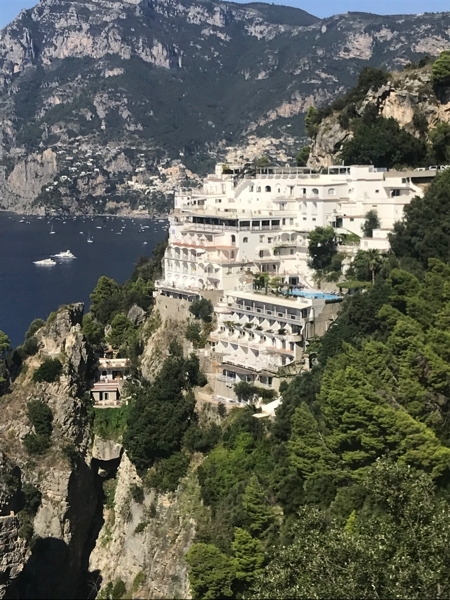 When we were planning this trip a couple of months ago, there were only a couple of optional side trips, but one of them was a full-day excursion to the Isle of Capri on day 9. 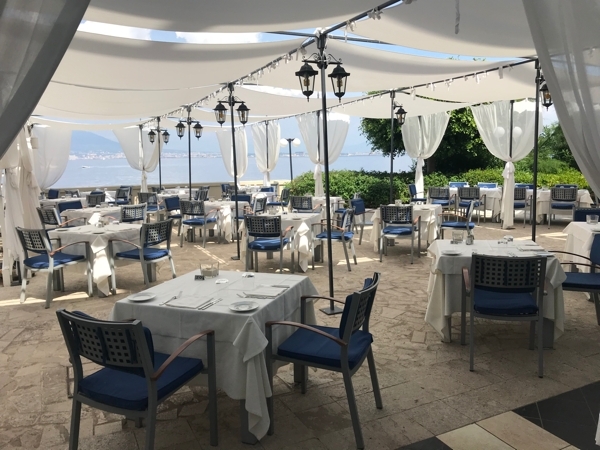 Ah, Capri! That epitome of Mediterranean islandness! Blue Grotto! Boat ride! Chair lift! However, a wise traveler knows himself. The Lovely First Wife is one who, when she travels, wants to DO ALL THE THINGS, KENNETH; me, not so much. I know my limits, and I knew that by day 9 of the trip I was going to need a personal day, particularly if where we were staying was a resort with spa. 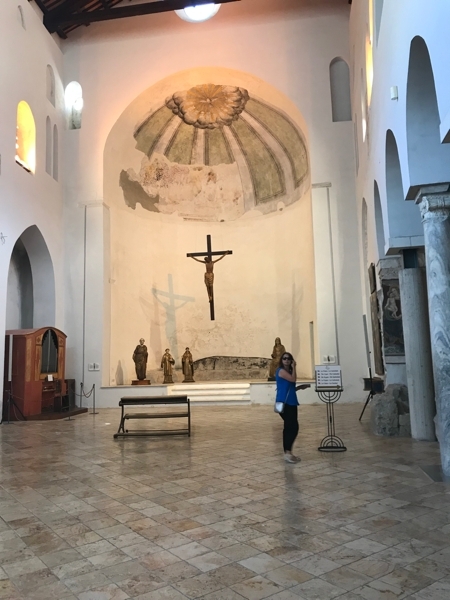 So way back in June or whenever it was, I (and Mary Frances) opted out of the optional excursion to Capri. Marc and LFW were going to forge ahead, and more power to them. 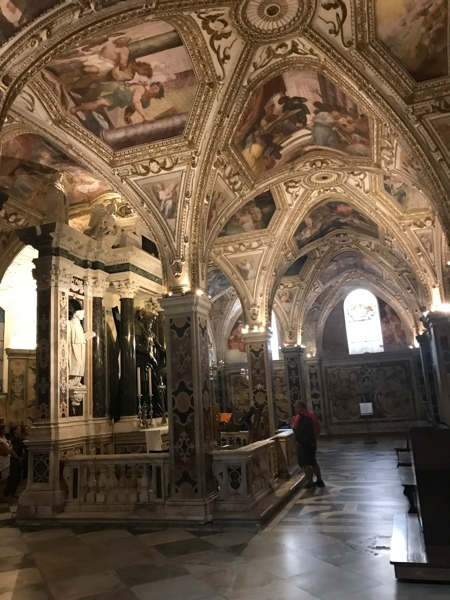 On these tours, once you arrive at your starting point your tour manager will continue to give you the option to sign up (if the excursions are not full). 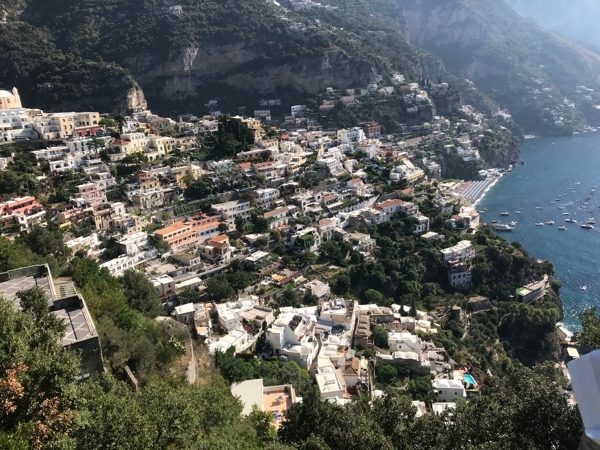 Poor Ignazio did his best to convince us to go to Capri all the way up to the last possible minute, but we stubbornly declined. I had a massage. I napped. I had cocktails. Anyway, the day passed in blissful sunshine and non-trudging; finally our spouses returned from what they claimed was a lovely excursion, although we did notice that they were hot, exhausted, and annoyed with the huge crowds and tacky tourist zones. (“Panama City of Italy,” they called it, so that would make it the “Redneck Riviera Riviera”?) We all won. About a third of the tour group had signed up for the short version of the tour, so they went home on Tuesday morning. 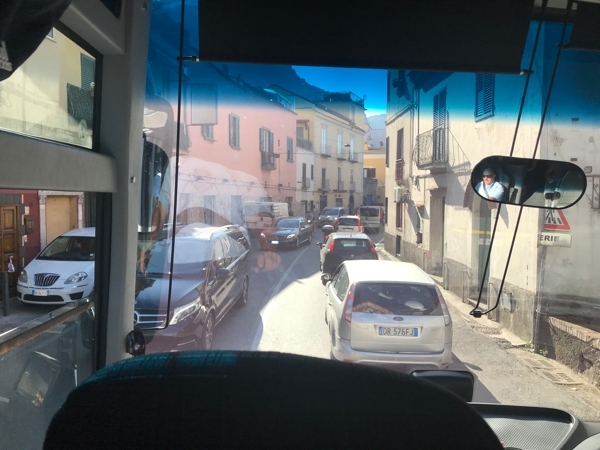 The rest of us loaded into the bus to drive down the Amalfi Coast to Amalfi. Whee! Can you say “vertiginous”? Whenever one travels, one does wonder what it would be like to move to the area. 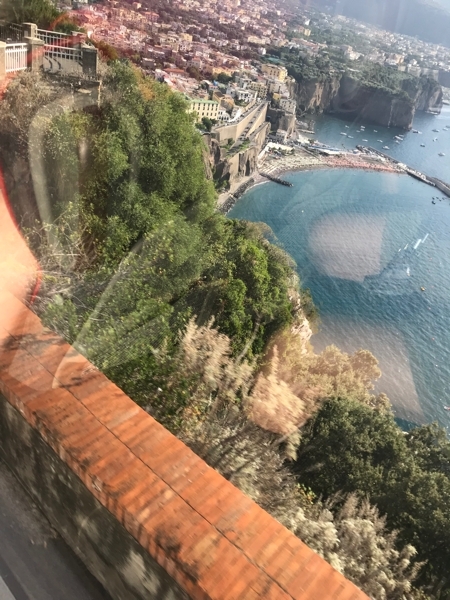 Amalfi is lovely, but OMG the traffic on that two-lane road! Bumper to bumper, and a lot of it tour buses easing past each other while scooters zip between them. It took us over an hour to go 18 km. People parked along the sides, buses parked along the sides. I would have to move in with Sophia Loren and use her yacht to go get groceries. See how they’ve left enough room for passing? (You think I am joking.) Notice also the car parked on the sidewalk. What are pedestrians to do? They could cross over and use that sidewalk on the other side IT IS TOO A SIDEWALK, or they could just step out into the street and go around the car. I could watch Italian traffic all day, especially intersections. Places where we would have traffic lights and turn lanes were miracles of smooth cooperation. It was like watching a video of what driverless cars would be like: each vehicle sensing when it was its turn to go. Somehow they make it work. I’d love to see data on traffic accidents per 1000 population for the U.S. and Italy (with accidents caused by non-Italians broken out). I suspect we’d see far fewer fender benders in Italy. 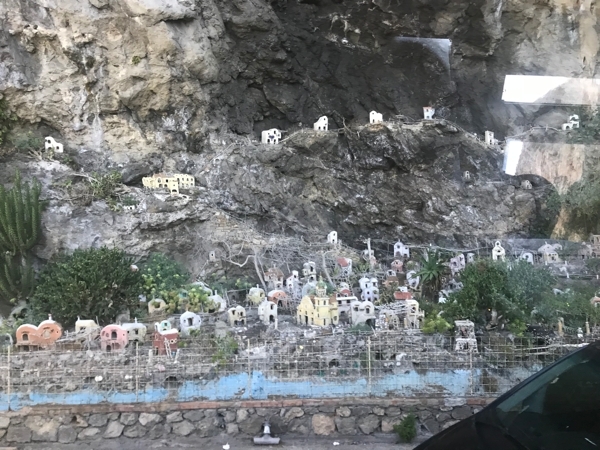 This is a miniaturization of the village we just passed through, and on the right-hand side, out of frame, is a little cliffside nativity. We’ve seen this before, right? 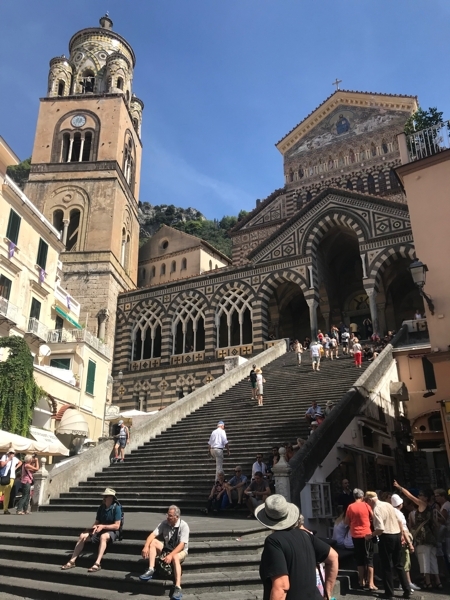 Historically, Amalfi was a maritime merchant stronghold, very wealthy and very secure. 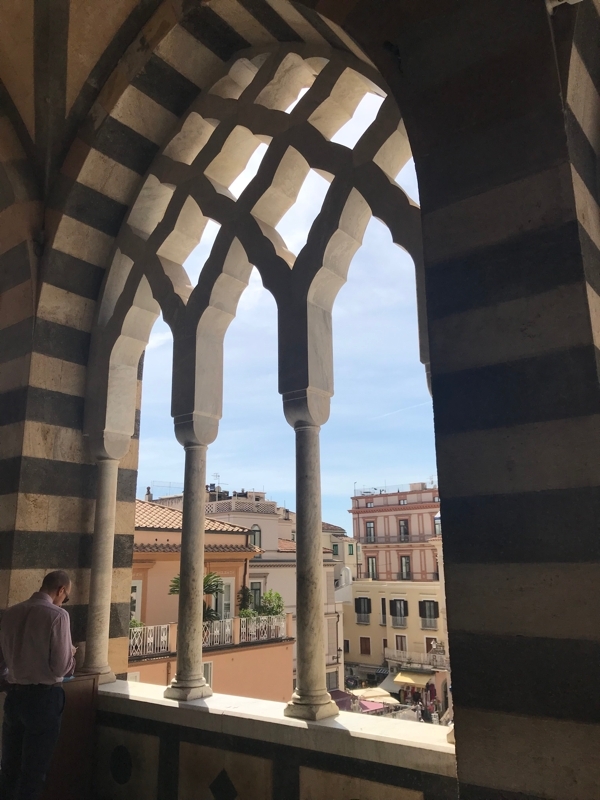 They built into the cliffs for protection, and like Venice, they never seemed to feel the need to abandon their preposterous location once they were safe. They are still building into the cliffs. Lunch was good; we saved a table for Sophia Loren, but she didn’t show. Some nice shopping areas, along with the usual touristy stuff. 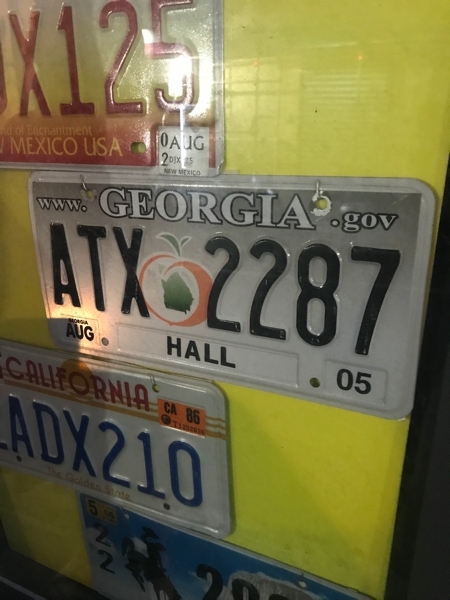 ADA compliance? Che cos’è quello? Originally built in the 9th century, it was redone and expanded and consolidated over the centuries into the current structure. 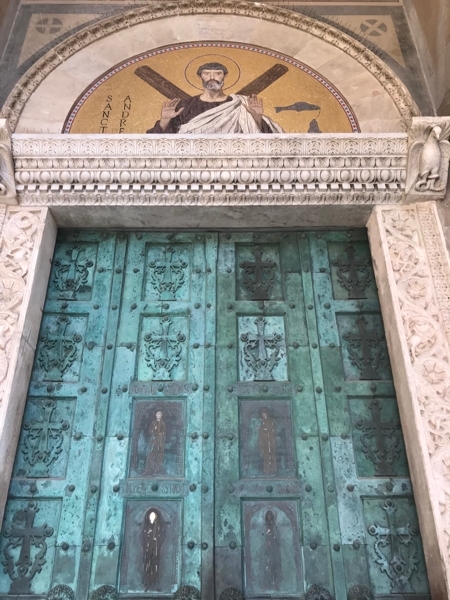 The front doors are bronze, made in Constantinople, and are the earliest post-Roman examples of the craft. 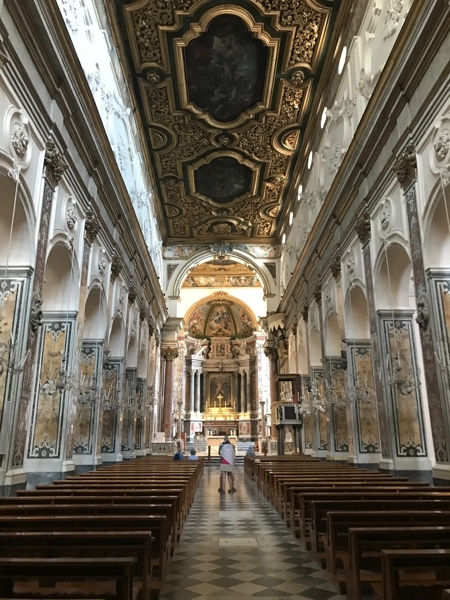 Altar on the left there, and around back you can peer into the crypt where they have the relics of St. Andrew. 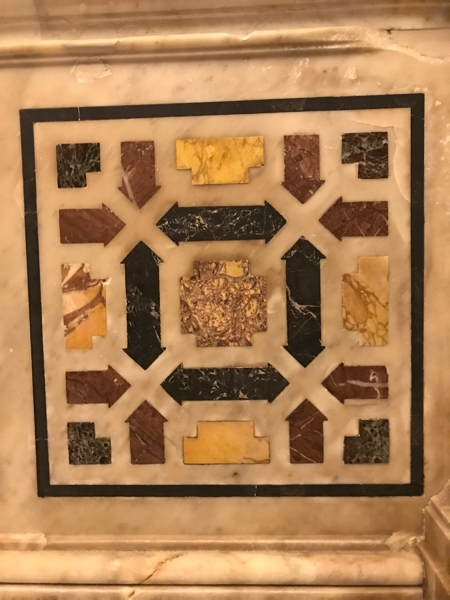 It was unlike any pattern I’d ever seen in these churches, and it’s only just now looking at it that I see the saltire/St. Andrew’s crosses in it. Ground/figure, go figure. Back to the bus, and thank Caesar we took a non-coastal route back to the hotel. Shower, prosecco on the terrace, and a shuttle into Vico Equense, where we ate our last meal in Italy at another restaurant named Tito’s. Lest Hall County start getting the big head, there was another, older one from Franklin County. Finally we caught the shuttle back to the hotel, repacked, went to sleep, woke up at 2:00 am, Kenneth, placed our bags in the hall, and boarded the bus at 3:00. 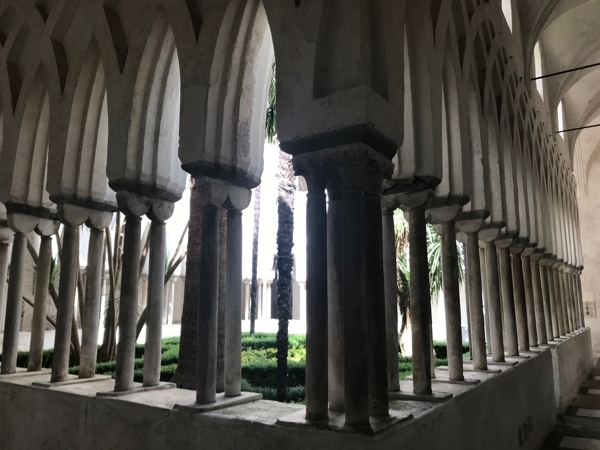 I will spare you the experience of getting back to Atlanta, only to say that watching the Business Class people get checked in first at the Naples airport, only to walk out the door to find a shuttle bus that would take all of us out to the tarmac, was a lot of fun. Also, Charles de Gaulle in Paris: you’re lovely, but you’re no Hartsfield-Jackson. FINALLY: PRO TIPS, next up.